I raced the mower around our new asparagus bed, eyeing it carefully. Lacy fern tops spread out above the trenches in the soil that my dad had so carefully dug. I stopped out of sight behind the garage, turned off the engine, and sat watching a dragonfly playing among the feathery branches that dipped and shivered in the Pennsylvania sunshine. It was a perfect moment. The next spring we got exactly six spears from our asparagus bed. We kids had a little procession as my father carried them up onto the back porch and handed the asparagus lovingly to my mother, who steamed it for dinner. Buttered, my single spear tasted of sweet spring grass tinged with hints of morning dew. And that delicate crunch! I tell you I was hooked right then and there. Nowadays we Bullhogs can’t get enough; in fact, asparagus is our favorite veggie in the springtime, and the perfect accompaniment to salmon. And while asparagus from California is in the stores already, in a few weeks the first local Yakima asparagus will start appearing, and then the real feeding frenzy begins. As to cooking? I still love those tender stems steamed lightly and dabbed with butter, because it takes me right back to my childhood. But our method of choice these days - especially when the sun shines - is on the grill. A note on choosing asparagus: The best asparagus has shiny flesh and a tight bud at the head of each spear. The base should be clean and white where it’s cut. Avoid asparagus spears whose bases are dark, dried out or cracked. For grilling, we find it best to use spears that are as thick as your fingers. Prepare the grill: Light 25 charcoal briquettes in a small grill (I use a Smoky Joe by Weber) and let them burn for 15 or 20 minutes until most of the black has gone. 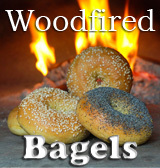 Spread out the red coals, add about 10 more fresh briquettes and leave the vents open. Clean the grill surface and put it in place. Prepare the asparagus: Rinse the spears and shake off the excess water. Holding a spear with two hands, find the place about 2 inches from the bottom where the woody base ends and the tender spear begins. Using a small amount of force, bend the spear at this point and the base will snap off. Snap off all the bases, leaving spears that are 6 or 7 inches long. Drizzle olive oil over the spears and lightly salt them. Grill the asparagus: Spread the spears crosswise on the grill, with the bases toward the center and the buds out to the edge. Let cook for a minute or two and then turn all of the asparagus over with tongs. (Avoid putting the lid in place unless you like your asparagus limp.) 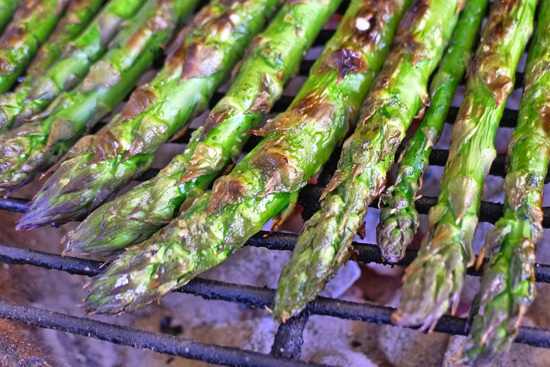 As the asparagus cooks, send the less-cooked spears to the middle of the grill and the more-cooked spears to the edges. Depending on the thickness of your spears, the asparagus will be grilled in 5 to 7 minutes. 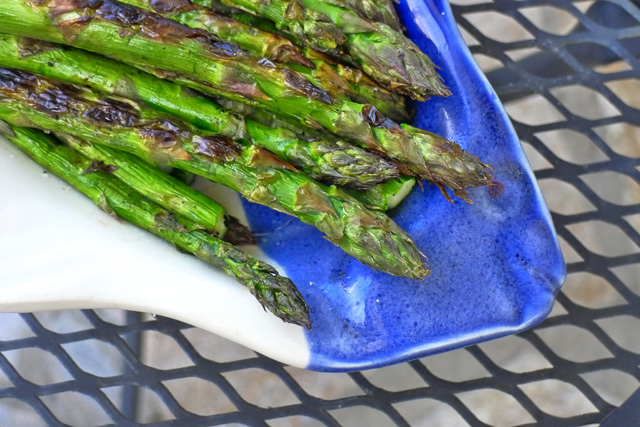 Serve this lovely grilled asparagus hot or cold. Asparagus is favourite around her as well Don!!!!! Oh, lovely! I’ve never grilled asparagus, but I enjoy a broiled version very much. Looks fantastic! I hated asparagus growing up as a kid, although all we ever got was in a can. I had no idea what fresh asparagus tasted like. It wasn’t till after college, that my vegan cousin served me grilled asparagus that I learned what I was missing all those years. Now, grilled asparagus is one of my favorite veggies. 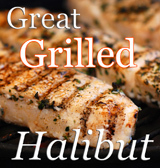 I think if more people had it grilled, then more people woul like it. Thanks for sharing your method. Nice story telling and you are right, that is the PERFECT way to prepare asparagus, nothing more, nothing less! I love grilled asparagus! My mouth is watering just looking at your photos. Thanks for posting! Asparagus is good for health.Have never grilled it but it seems so tasty will follow your recipe thanks.